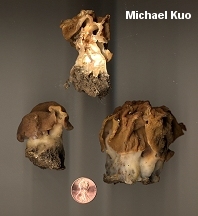 "Gyromitra gigas," found in many field guides, is recognized among species of Gyromitra by its massive stem and its squarish, tightly adherent cap. 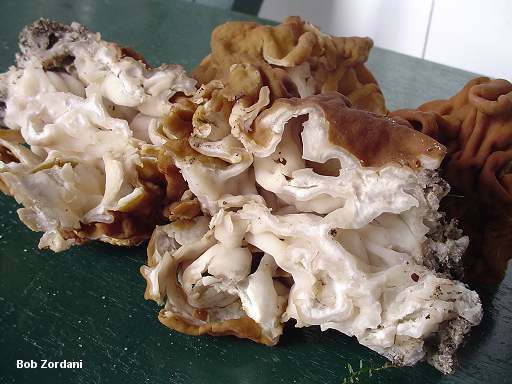 Some mycologists split Gyromitra gigas into two species, Gyromitra korfii and Gyromitra montana. 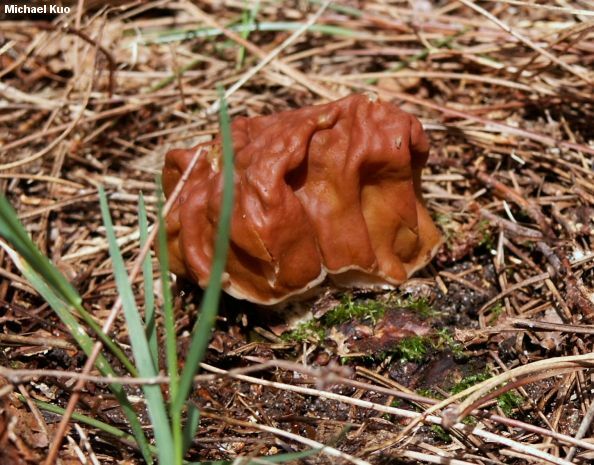 Gyromitra korfii has a stout, massive stem, and a tan to golden brown or brown cap. 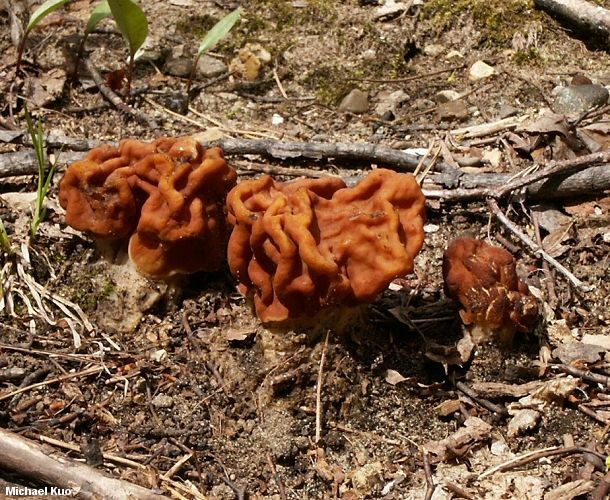 It is extremely difficult to distinguish from Gyromitra montana on the basis of field characteristics--although the two mushrooms do apparently grow in different places. 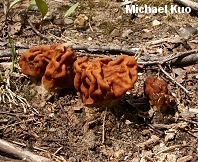 Gyromitra korfii appears to be limited to territory east of the Rockies, while Gyromitra montana is apparently found in the Rockies and westward. Ultimately the two species should be separated on the basis of spore characteristics: the spores of Gyromitra korfii are fusoid and fairly thin (10-13 µ wide), featuring conspicuous blunt, knob-like ends when mature--while the spores of Gyromitra montana are ellipsoid and wide (11.5-15 µ wide), developing variable apiculi that are frequently less conspicuous. 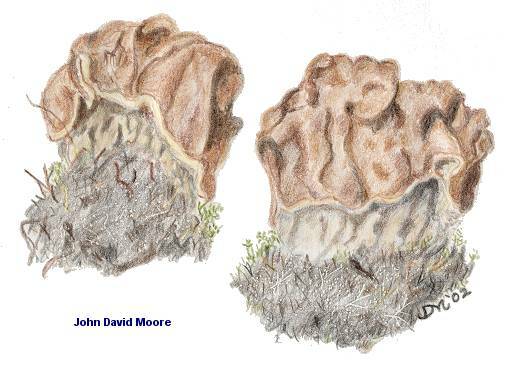 Ecology: Officially saprobic, but potentially also mycorrhizal--or, like the true morels, donning both ecological hats in the course of its life cycle; found under hardwoods in spring; east of the Rocky Mountains. 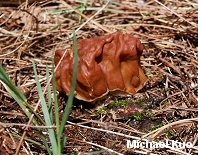 I once found Gyromitra korfii growing out of the side of a dead big-toothed aspen, five feet above the ground! Cap: 3-10 cm high; 4-10 cm across; variable in shape but often blocky and squarish; sometimes vaguely lobed; tightly affixed; broadly wrinkled; convoluted; tan to brown, rarely cinnamon or tawny; undersurface whitish to pale brownish, ingrown with stem where contact occurs. Stem: 3-8 cm high; 2-6 cm wide; pale tan to whitish; bald; developing broad ribs or waves. 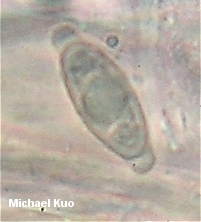 Microscopic Features: Spores 25-37 x 10-13 µ; broadly fusiform, with a wide, knoblike apiculus (1-3.5 µ high and 3 µ wide) developing at each end with maturity; with one large oil droplet and numerous smaller droplets. Asci 8-spored. Paraphyses clavate to cylindric; with golden to brownish, orangish, or reddish contents. REFERENCES: (Raitvir, 1970) Harmaja, 1973. (Raitvir, 1970; Harmaja, 1973; Smith, Smith & Weber, 1981; Weber, 1995; Lincoff, 1992 [as "G. fastigiata"]; Abbott & Currah, 1997; Roody, 2003; McNeil, 2006; Kuo, 2005.) Herb. Kuo 05259503, 05170201, 04240302, 05010402, 05150401.